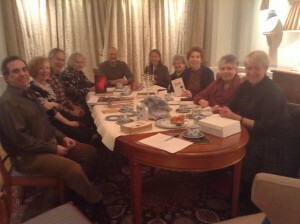 The Hampstead Book Club held its last meeting of the year on Sunday 6th December, lighting candles for the first night of Chanukah and discussing Michael Mail’s book “Exposure”. Based on a true incident from the late 1980s, it tells of a young Jewish photographer who, rediscovering her roots, takes an ageing Jewish community in the East End as the subject of a photographic study, and the explosive events that follow. We were privileged to be joined by the author himself, and a very interesting discussion followed on the book itself and the issues it raised. This was a first for the club, and we all enjoyed the opportunity to talk about the genesis of the book and the process of writing and publishing it, and we are very grateful to Michael for making the time to join us. “Exposure” is available on Amazon, as are Michael’s other novels, “Coralena” and “The Three Graves of Samuel Braden”. Michael has also worked with the photographer Judah Passow on a photographic study of the Jewish communities of Scotland, recently published by Bloomsbury, and is currently working on a project to identify and conserve the architectural heritage of Jewish communities throughout Europe and beyond. The book Club is now entering its third year of existence and has just agreed its programme for 2016. Anyone who is interested should contact Candice at the synagogue office for further details.